On this spiritual path that we have dedicated ourselves to, we will find ourselves tested on a daily basis on a spiritual and mental and physical level. This is as it should be, otherwise how could we grow, how could we test our mettle! To say the least this is a narrow definition of the Ordeal, a concept that was dealt with consciously on a daily basis by our forebears because it was so enmeshed in the lore of all life’s activities. The Rune N Nauthiz is the Rune of Resistance in the multiverse so it would also equate to the primary Rune of the Ordeal. Meditation on this Rune is indispensable to understanding the Ordeal. An example of a common Ordeal our ancestors underwent to transform their tribal status from adolescence to adulthood was that the youth upon reaching a certain age or physical and mental stature were given the task or Ordeal of going on a hunt by themselves to slay an Auroch, a now extinct very large and extremely dangerous wild bovine – and to return with its horns as well as bring back its dressed out meat I assume. This was very deadly business, but if they returned successfully their status in the tribe was exalted to adulthood, the warrior. These tribal ordeals were necessary for maintaining a strong tribe. An example on a Historic Mythic and Heroic epic level would be the Saga of our great Germanic hero Sigfrid or, as known in the Poetic Edda, Sigurd the dragon slayer. Read and study all that you can on this great epic tale and you will see a great man, he is great because he underwent tremendous ordeals. The greater a person is on whatever level of greatness – so too to the greater their personal Ordeals are. This is true also for families, communities, nations, and races. The Ordeal isn’t limited to only our human level of Midgarth but impacts all the worlds so wide. The second half of our Ninth Charge says “to bear with courage the decrees of the Norns.” When undergoing Ordeal this is paramount to personal and trans-personal greatness. And Ordeal not only could test ones guilt or innocence, but ones worth or unworthiness as well. A person earns spiritual might in the Nine Noble Virtues by continuing to go through the process of the Ordeal on a moment to moment, day to day basis. I have met a significant number of Odinists who have had an alcohol or drug addiction problem in their past so I will use a modern day example of the Ordeal process someone in this predicament of putting an alcohol or drug addiction behind then. This person will be tested and tested and then tested again – situations will pop up that will make it so easy to continue to be a slave to alcohol or drugs. For a person in this predicament, alcohol and or drugs are what is being used to test ones will power, discipline, perseverance, courage, fidelity, truth, as well as aspects of all the noble virtues. I mean to say by this example that we are tested by Ordeal each day in that area or areas that we need to transform ourselves to a higher level of strength. Because the Ordeal truly is the alchemical process that transforms us into the metaphorical gold of the Philosopher’s Stone. We must embrace the Ordeals that come our way because they are what define who we are, that which purges us of our weakness and shapes our strength. I used to give a verbal teaching on Ordeal in relation to Tyr as a great God of the Ordeal so I will start here. Valiant Tyr is this God of Justice, law and order and much more. For this reason he is the pre-eminent God of Ordeal, to reiterate; an Ordeal is being tested or tried by struggle, trial or conflict and being able to define a conclusion to this struggle, trial or conflict as and end result! The Great and Valiant Tyr, the God of the Ordeal himself undergoes on infinitely cosmic level Ordeal. Most Odinists with a basic education in our spiritual myths and lore knows the story of Tyr (Order) binding the Fenris Wolf (Chaos). Nonetheless I will tell a condensed version of this sacred myth for the sake of food for thought. Fenris is young but the High Gods know that his destiny is to usher in the age of the Ragnarok in league with other destructive beings, so they make the wise decision to rear Fenris up in a place in Asgard so they can keep an eye on him. This reminds me of the saying keep your friends close, but your enemies closer. Any way Tyr is the most valiant of Gods and he is the only one capable of approaching Fenris to feed and care for him – because law and order is the counterpoint to Chaos! The Gods watch Fenris closely and just as they knew he would grow at an alarming pace in stature and strength. They now realise that they must fetter Fenris to prevent him from starting a cosmic campaign of rage and utter destruction. They have a great Fetter, which they call Leyding and give it to Tyr so that he can bind Fenris. Tyr approaches Fenris and shows him the great Fetter called Leyding and he speaks to Fenris saying Fenris you are growing into such a mighty form so I brought this mighty Fetter for you to look at and maybe you can prove that your might is greater yet than Leyding the great Fetter. But on the other hand if you fear this Ordeal to prove your great strength we will understand because after all look at how great the Fetter Leyding appears to be. Being provoked in this manner Fenris in return laughs and says Tyr I will take you up on this challenge to test try strength. And so he allowed Tyr to bind him with the Fetter Leyding. He immediately bunched up his muscles made a slight grimace and just like that the Fetter Leyding was broken and Fenris laughing said look how great I am. The Gods privately hold court and agree that a new Fetter must be made to bind Fenris so the Gods have a new Fetter made, it was an amazing Fetter greater than anything made before it, once again they presented it to Tyr and once again he provoked Fenris with this new Fetter called Dromi. Fenris accepted his second challenge and just as before Fenris with a bit more grunting and grimacing breaks the great Fetter Dromi as he had Leyding before. Meanwhile Fenris has continued to grow in might and main and the Gods realise they have one more chance only to halt the impending doom in all the worlds wide. The High Gods send the Holy messenger Skirnir with urgent information and six secret things that had been collected in order to make a magical Fetter to bind Fenris – Skirnir meets with the Dwarfish folk or primal Artists if you prefer, and a magical Fetter is once more given to Tyr who approaches Fenris one last time, just as before provoking him to test his power against Gleipnir. Fenris recognises a magical quality to this third Fetter; it is very thin and silky and has a very powerful magical aura about it. Fenris tells Tyr; “I believe I will pass up on this third Ordeal to test my strength as I don’t believe I will gain any fame if I do tear such a funny looking Fetter apart. And further if it is made with magic as I suspect, it’s not going on my neck or legs.” The Gods tell Fenris if you can’t break this new Fetter it will prove we have no more need to be concerned with you harming the balance in the worlds so wide. Fenris says if I let you bind me with Gleipnir and I can’t break it – I know that I will receive no assistance any time soon releasing me from Gleipnir so in good faith one of you place your hand in my mouth and I will let you bind me as before, and this way I know you will release me if I can’t break myself free from, Gleipnir. So the valiant Tyr places his right hand up to his wrist in Fenris mouth and Fenris is bound with Gleipnir. Fenris attempts to break his Fetter and the more he struggles the stronger Gleipnir becomes on him, he tries and tries to no avail, he is bound. He growls at Tyr “release me now” and Tyr looks him in the eye and says “some times it takes the greatest courage to do what’s right and doing what’s right isn’t always pain free – This is one of those times because you will remain bound by Gleipnir.” Fenris at that point bites Tyr’s hand off up to his wrist. I told this tale in a condensed version of my own; the exhaustive version is far superior. And I would suggest that any one who has not should study the exhaustive version, which is essential to gaining great wisdom from this sacred spiritual myth. A few more words on this myth: We see that Fenris undergoes an Ordeal presented by Tyr on three separate occasions. To the joy of all life Fenris failed his third Ordeal. On the other hand Tyr also undergoes the three great cosmic level Ordeals that define who the Great God Tyr is. His status as the most valiant of Gods is defined and he proves himself to be bold as his blood red Rune – as well as exemplifies himself as a God of Selfless sacrifice for the good of all. Meditation and study of his Rune Tiwaz will reveal awesome and glorious information about Tyr as defined by his cosmic Ordeal. I believe Tyr is a primary God of Ordeal, all the same all the Gods undergo cosmic level Ordeals and guide us their human Kinfolk on the path of victory. I can give many examples of Odin victoriously undergoing Ordeals, Ordeals of which transform one from one state of being to another. Ordeals are initiations in life and Odin is the Great Initiator – what better initiation than the initiation into the great Ordeal of life in order to transform ones consciousness to an ever expanded and illuminating level of awareness towards the prime objective of Odinic consciousness. From the Poetic Edda translated by Lee M. Hollander, we go to the lay of Vafthruthnir. Vafthruthnir is a giant mighty in wisdom and Odin desires to test his wisdom against that of Vafthruthnir. Odin asks his beloved wife the Great Mother and Queen of Asgard Frigga what she advises and she is completely against the idea. This only causes Odin’s desire to match his wisdom against Vafthruthnir all the more so he goes to the giant’s great hall and challenges him. Vafthruthnir tells Odin if he gains entry into his hall and proves to be lesser in lore than he – then he will forfeit his life. This doesn’t discourage Odin in the least and so the Ordeal begins – a test of wisdom even to gain wisdom into the wise giant’s hall. Odin wins entry and Vafthruthnir welcomes Odin but says who ever fails the next level of the Ordeal shall lose their head to the other. To cut a long story short Odin wins the final outcome of this great test. Both Odin and Vafthruthnir were tested by Ordeal, Vafthruthnir is a giant in wisdom and lore and I believe probably a teacher of Odin. Odin has to surpass the wisdom and lore of the teacher. After his initial learning then Odin goes out in the worlds so wide testing his wisdom and gains the spiritual gold of experience, after which he must return to test himself against the vast lore and wisdom of his former teacher Vafthruthnir. 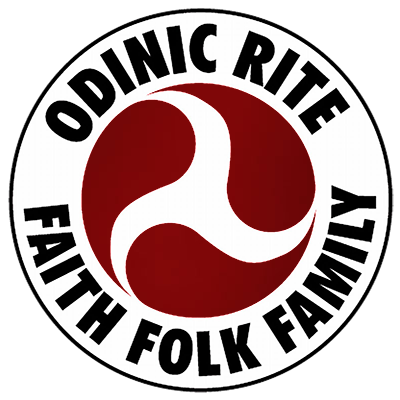 This is more in line with my personal opinion especially after expanding my spiritual outlook by reading parts 1 & 2 of “Odinic Myths in the 21st Century by the Circle of Ostara.” Some of the other cosmic level Ordeals Odin undergoes is the gaining of the Runes by hanging on Yggdrasil for nine nights, His gaining of the Mead of Inspiration, and the Ordeal of gaining a sip from Mimir’s Well of Knowledge. Again I greatly encourage everyone to study and meditate on our spiritual concerning Ordeal. They are lessons that will teach and guide us victoriously through our own personal and transpersonal Ordeals in life. While we may not be tested on a cosmic level like the High Gods, we are tested day to day by arrogance, anger depression, addiction, and hosts of other things easily and not so easily identified. The thing is, the High Gods have given us the Nine Noble Virtues to overcome any Ordeal no matter how great or small.